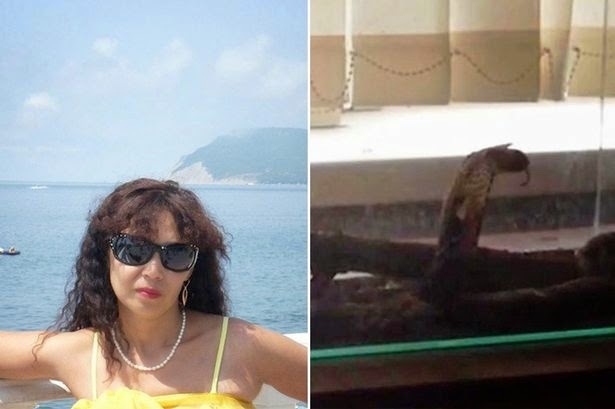 A young woman is now in a coma and is hanging on life’s end after she was bitten by a cobra while striking a pose for selfie with the venomous snake in Dermontovo, a southern Russian village. The police accused the man who was offering the ‘snake selfie’ service to tourists on which one could have an opportunity to take a selfie with the cobra. If the woman dies, he will face a charge on manslaughter, according to authorities. The man, identified as Oliver Matveyev, 34, was believed to convince the victim to take a selfie with his pet. However, even before the camera could capture the photo, the cobra struck and bit her. Immediately, she was taken into the hospital, but fell into a coma later. On Matveyev’s defense, he told the police officers that it was the first time that his pet snake has ever bitten a patron. According to him, he had been offering this service for several years already; at first, just an ordinary photo with the snake, but then he changed it to ‘snake selfie’ to go along with the popular trend. Moreover, he reasoned that he’s been offering the ‘selfie with a difference’ to sunbathing tourists near Kuban River Banks and in fact, none like this has ever happened before. “I don’t understand it, the snake had never bitten anyone before,” Matveyev told the police. His accounts wouldn’t be that effective though because he did not even carry an antidote for snake bite, which could have avoided the unfortunate accident. He should have also cared enough to remove the venom from the cobra. Furthermore, he could be facing more charges, now that he could not provide a license for his pet when he got arrested. Currently, the media is still waiting for the woman to be identified. She has not yet woken up from the coma as of today. If, it comes to a point that, the victim will succumb to the deadly snake bite, Matveyev will face potential manslaughter, or even murder charges, the authorities threatened.